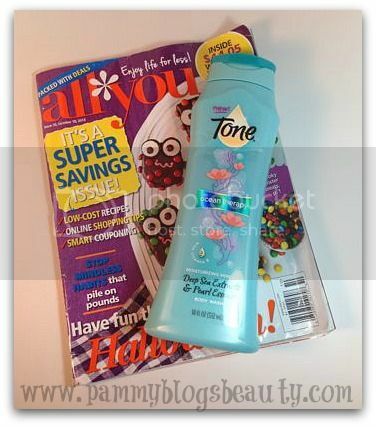 Pammy Blogs Beauty: Tone Ocean Therapy Body Wash: Review and Giveaway!!! Tone Ocean Therapy Body Wash: Review and Giveaway!!! I love using Body Wash in the shower! For me, my body wash is all about the scent. 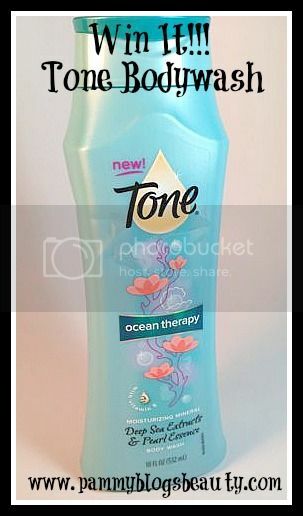 This Tone Ocean Therapy has the freshest scent! Fresh scents are usually what I gravitate towards during my morning shower. Tone's Ocean therapy's scent is fresh and clean and reminiscent of fruit with a slight hint of floral. I honestly can't quite place or describe the scent...but, it just smells good! :) It cleanses without over-drying while producing a great lather. Just what I want in a body wash! Tone wants you to "spoil yourself" this October! Be sure to enter the Giveway!!! Prize is shipped directly to the winners by Tone/All You. Pammy Blogs Beauty is not responsible for items lost or damaged in mail/transit. Prize fulfillment is through Tone/All You. Prize is not redeemable for cash. Contest runs from 10/18/13 - 11/1/13. Winners have 48 hours to respond to winning email from Pammy Blogs Beauty or a new winner/winners will be selected. 3. Answer question in comment form below: Have you tried Tone's Body Wash before? What is your favorite scent? I have not tried it yet but....I would be willing to try it! No, Tone is a brand of Body Wash I've never tried before. Yes, I have tried Tone Before, but only in the Mango Splash scent so far. I haven't tried this body wash yet but it sounds awesome. I haven't tried Tone yet. I haven't tried it yet, but I have heard good things! I Haven't tried any Tone Body Washes yet, I've smelled them before, but haven't had the chance to actually use them. I have not tried Tone before, but would love too. I haven't but I'd love to! I haven't used the new Tone body washes yet. I'd love to, though! I have never used Tone before. I have not tried but I would love to! I haven't tried the body wash yet, but I've tried Tone bar soap and it's smells good and is moisturizing. I haven't tried Tone's Body Wash before. 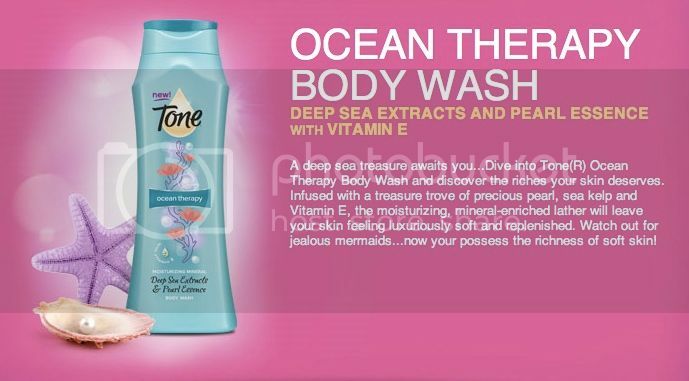 Tone's Ocean Therapy Body Wash sounds wonderful! I Love Tone! They are a VERY high quality product that REALLY doesn't break the bank. You get a lot of product for a little price.. plus it is hard to find a Tone scent that you WON'T like! (= Great Product!